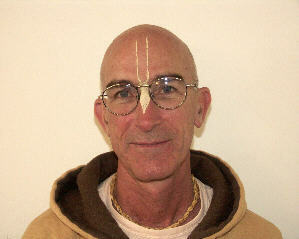 After experimenting with various spiritual practices and mantras, an American youth finally comes to Krishna. I grew up in Los Angeles. Once, when I was visiting a friend I saw a person on TV speaking about spirituality, I found it interesting. He was speaking about Transcendental Meditation, an organization founded by Maharishi Mahesh Yogi. I went to their center and took a three-day course. They informed me, if after the course I wanted a mantra they would give one to me but it would cost $120, I did that and they gave me my mantra “ain ga.” Twice a day I would chant this mantra for fifteen minutes. This was how I began meditating. But after two months of such meditating I thought, “There must be a better mantra than this.” I decided to travel. My intention was to find something like a paradise where I could live with spiritually minded people and do my meditation. Before I left I bought “Be Here Now,” a book by Baba Ram Dass, a famous American guru of the sixties and seventies. In his book he wrote, “When one progresses on the spiritual path, he gradually becomes detached from material things.” I felt like I was on this path, that God was taking me to a place where I would forget the materialistic life I had been living. In one place where I stopped in my travels, almost all my things were stolenbut I felt relieved, because I knew having fewer possessions would help me in my quest. All I had now was some money, my book, and my passport. I decided to go to the Bahamas, off the coast of Florida. I thought this might be a good place to practice my spiritual life. It wasn’t. I decided to leave the day after I arrived. But before I left, someone stole my money; it wasn’t much, just a couple of hundred dollars, but it was all the money I had. Now I had no money. All I had were the book by Baba Ram Das, my passport, and my ticket back to the States. But I was happier than I had ever been before because I knew beyond a shadow of a doubt that God was making an arrangement for my life. The next day I went to Miami to see what would next unfold on this journey. I went hitchhiking, not knowing where I was going. Someone picked me up and suggested I go to Key West Florida to get a job. Taking this as God’s will, I went there and got a job. I was still reading “Be Here Now.” In the back of the book there was a list of other recommended books. One of the books was the Bhagavad-gita. I went to the public library and found that there were four different translations. The one by Prabhupada was the most attractive, so I checked it out. From the first page I understood that this is what I had been searching for, my search was over. As I read, I became totally amazed. I had never read anything that was so clear and made so much sense. From reading the Bhagavad-gita I started chanting Hare Krishna all day. I had this job where there weren’t any people around, so I just did my work and chanted. I was getting a spiritual high from it. After three days of chanting, I stepped out of the building where I worked and saw devotees doing harinama about a hundred yards away. I went over to them and said, “That’s the same mantra I chant.” They were, of course, very happy to hear this. They then explained the philosophy to me for about two hours. That night I moved in with them. There were about three devotees living and working out of an apartment. After a week or so they told me about a temple in Miami and suggested I go there to get more training. The Miami temple was beautiful. It stood on eight lush acres. On six of these acres we grew flowers that we would send to temples all around the USA for Deity worship. My first service was picking flowers; my second service was washing Krishna’s pots. There were also eighty mango trees, many banana trees, and about sixty other tropical plants. There was a nice pond with swans and ducks. I remember that the ducks always had orange beaks during the mango season because they had a special liking for the mangoes that had fallen on the ground. The devotees were very nice. I had found my home. When I was leaving Los Angeles a couple of months earlier, I was looking for a paradise where I could practice my spiritual life. I had found it. After I’d spent two months washing pots and picking flowers, the temple president, Narahari Prabhu, asked me if I was bold. I said I could be. He then asked me to try sankirtana. At first we were just distributing BTG’s in Miami. I was going to the street lights distributing to the people who would stop at the lights. Very difficult, lots of purification. It was quite hot, and the people had already been approached by so many other groups. After two months of that, they asked me to try the airport. After about seven years I became the sankirtana leader. In 2002 the GBC asked me to be the Minister of Book Distribution. What attracted me to book distribution was the emphasis on it. This was 1978, shortly after Srila Prabhupada had left the planet, so the momentum was still there. It was and is a very blissful activity. So this is what has kept me doing it for as long as I have. It’s bliss.